The sand had been cleared down to ground level. Right across the outside of the doorway lay a great oblong of limestone, quite seven feet long by three feet wide. It was far too big and rough to be a doorstep, and in any case, this was not the outer wall of the house. It must have weighed several hundredweights. Four short poles were found, and these were worked very carefully under the outer long side. Sweating and straining, four of the workmen began to raise the outer edge inch by inch, pivoting it up on the inner edge. Stones were slipped in to hold it when they paused for breath or to work the levers further in. A few chunks of limestone, cracked probably by the first crash when the lintel fell, broke away from the edges and lay in the sand. Would the whole thing crack to pieces as the great weight left the support of the ground? At a word from Ali Sheraif, the Gufti in charge, the men bent to the poles again, marvellously slow and careful, grunting to each other words of warning. We were all in it together somehow. They were just as keen to get it up intact as we were and I am perfectly certain it wasn’t only the prospect of good backshish ahead. As for us, we stood round in a sort of desperate tension of silence. When the front edge was about six inches off the ground and more supports had been wedged in, Tommy slid his long length alongside and got as much of his head as he could into the narrow space. “Are those supports all right?” Hilda murmured uncomfortably. A strangled, very sandy “Gosh!” floated up from the depths. “Is there anything?” asked John, moving about anxiously. Tommy withdrew his head and, with maddening deliberation, folded himself up again, rather like a camel, looking up at us. His beaming countenance, sunburned by now to a rich tomato, was beaming, and his spectacles flashed in the sun. “It’s covered in bright colours,” he said, in a rather shaky voice, and then, bringing out his trump card: “and simply smothered with inscriptions!” . . .
No one knew where Nefertiti’s remains were laid, or indeed if any honour was paid her in death. 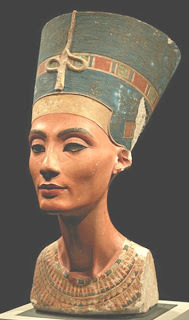 But now I knew this that Nefertiti had lived close to this old house where we now sat talking about her; had passed the remaining few bitter years of her life, in the place that she made the last defiant stronghold of Atenism (the religion formed by her husband). Our house, quite close to her northern dwelling that she named ‘Castle of the Aten’, was very large in comparison to many of the other private houses; perhaps it had belonged to one of her friends, or to a Minister of the new young Pharaoh [Tutankamun]. Nefertiti must have known this house. It’s not too fantastic to think that sometimes, long ago, people sitting as we were now, in this very room, may have heard the murmur of servants’ voices out beyond the Central Room, speaking the lovely name as she drew near: “Nefertiti. It is Nefertiti. The Beautiful Lady comes!” And in a moment she may have passed through this doorway, trodden this floor, and perhaps sat talking to her host with a small sandalled foot resting on this column base by my chair.